‘Tis the season that speeds time up to twice it’s normal speed! In the blink of an eye it will be Christmas, and another blink and it’s all over again. Do you have your tree up yet, and your house decorated? What about all your shopping, is it done? Do you bake for Christmas? And what about yourself? Are you ready, do you have some outfits that look awesome but yet can stand the test of a few turkey dinners and a couple of bottles of wine? I for one am so grateful that the fashion this season is comfortable and easy to wear yet looks fantastic. The beautiful thing is that anything goes this winter. Leggings and tunic tops or oversized sweaters, skinny pants or wide trouser leg pants, cardigans, blouses, dresses, ponchos. There is just no right or wrong this year. Colour blocking is a big trend as is mixing prints and textures. Be creative! Does your Christmas tree resemble your fashion sense? Do you decorate it with funky homemade ornaments mixed with newly acquired more pricy pieces? Do you have a definite colour theme going on? Or a specific overall theme like a country or a Victorian Christmas? My collection has grown to three trees, one has my kids’ homemade ornaments on it, from their times at nursery school and up to grade 4 or 5. So many memories and smiles in that tree. I have one tree that is “perfect” it’s got gold, brown and celery green ornaments in it, spaced perfectly and pretty from every angle. My favourite tree is 10’ tall and absolutely crammed with every ornament imaginable. Things that came from my parents home in Holland, things that I got when I was a teenager, homemade ornaments I got from friends and family. Every ornament has a story, and I don’t care if it goes with a theme or not. Every year when they come out of the boxes it’s like meeting old friends again after a year! We smile and discuss our memories. 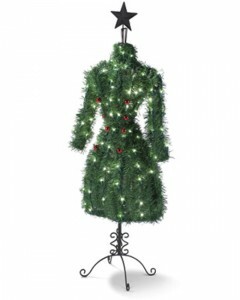 I think my fashion sense mostly resembles my favourite Christmas tree… as long as I like it and it makes me smile I will find a place for it in my closet. And come to think of it that also describes our store to a T. We are filled to the brim with items that make us smile, fashions that would be equally at home in a 20 year old’s closet as well as a 70 year old’s wardrobe. We carefully scour the trends and traditions and pick the items that we know every woman would love to have in her collection. Hope your house and your wardrobe is filled with happy pieces, enjoy the December hustle and bustle!